This vintage olive green and bright lemon yellow enamel gold washed sterling silver three dimensional lily-pads and flowers pin and earrings set is signed D-A NORWAY STERLING 925S and and has the Willy Winnaess hallmark of a W in a circle as well as the DAVID ANDERSEN scales hallmark. The pin m easures approximately 2" by 1-7/8" and weighs 20.4 grams. The secure holding clip on earrings measure approximately 7/8" by 15/16" and weigh 10.4 grams. This is a beautiful set, more vibrant in real life. The olive green is not varied in color as the second photo shows. This is from the scanner. Photos are not actual size. 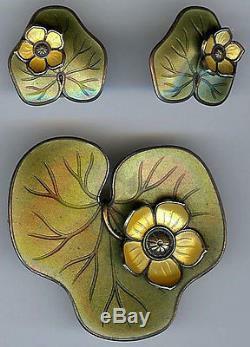 The item "DAVID ANDERSEN NORWAY VINTAGE STERLING OLIVE ENAMEL LILY PAD PIN & EARRINGS SET" is in sale since Tuesday, November 20, 2012. This item is in the category "Jewelry & Watches\Vintage & Antique Jewelry\Vintage Ethnic/Regional/Tribal\Scandinavian". The seller is "deja--voodoo" and is located in Santa Cruz, California. This item can be shipped worldwide.